Norphar Prices: Drugs from Canada - Price in American Dollars. Prescribed in combination with the antibiotics Biaxin and Amoxil, Nexium is also used to treat the infection that causes most duodenal ulcers (ulcers occurring just beyond the exit from the stomach). Like its sister drug Prilosec, Nexium works by reducing the production of stomach acid. 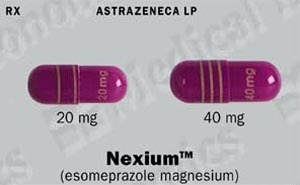 Nexium comes in delayed-release capsules that should be swallowed whole. Be sure to avoid crushing or chewing the capsules. Take Nexium at least one hour before meals. Be careful to swallow it whole. If you have trouble swallowing capsules, you can open the capsule and carefully pour the pellets onto one tablespoon of applesauce. The applesauce should not be hot. Mix in the pellets, then swallow the applesauce immediately, without chewing. If you miss a dose...Take it as soon as you remember. If it is almost time for your next dose, skip the one you missed and go back to your regular schedule. Never take 2 doses at the same time. Storage instructions...Store at room temperature in a tightly closed container. Side effects cannot be anticipated. If any develop or change in intensity, inform your doctor as soon as possible. Only your doctor can determine if it is safe for you to continue taking Nexium. The antibiotics prescribed in conjunction with Nexium for the treatment of ulcers have occasionally been known to cause severe side effects and life-threatening allergic reactions. If you've been prescribed this combination, be sure to check the entries on Amoxil and Biaxin for more information. There's no problem, however, with combining antacids and Nexium; no unwanted interaction will result. Note: This information is strictly for educational purposes and should not substitute for the opinion of a doctor. Norphar offers Nexium from Canada priced in American dollars for people whose insurance covers prescription medication from Canada i.e. United Healthcare. Our service is also for people in the U.S. that are uninsured or on Medicare that are underinsured for prescription medication. The prices and terms set forth on this page are subject to change without notice. Please consult a Norphar representative for specific prices and terms for each medication.